The population of a settlement is how many people live there. When people first looked for permanent places to settle a long time ago, they had to look around to make sure that the area could provide: food, water and materials for building and clothes. 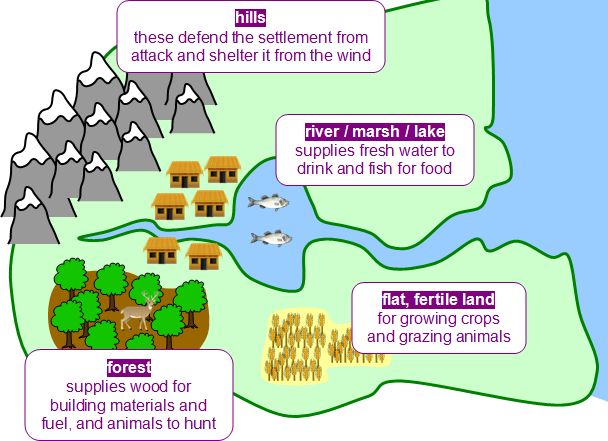 Early settlements were usually near rivers or springs, and on land where people could raise animals and grow crops. These sites had natural advantages over others. After deciding on a good area, people then to choose the exact site for their settlement very carefully. They preferred to live in places that were easy to defend, such as hillsides. They also chose places that were protected from floods or bad weather. Rural areas are said to be sparsely populated (with few people living over a large area) whilst urban areas are said to be densely populated (with lots of people living in a small area). The speed at which a population of a settlement grows is called the growth rate. It changes depending on how many people are born there (the birth rate) and how many people die there (the death rate) each year. These are mostly affected by the standard of health care - if doctors and drugs are available, more babies survive and live longer. In the UK, around 12 people are born and 10 people die for every thousand people in the population, so its population is growing. Migration is the movement of people from one place to another to live or work. People leaving a country are called emigrants. Those settling in a new country are called immigrants.